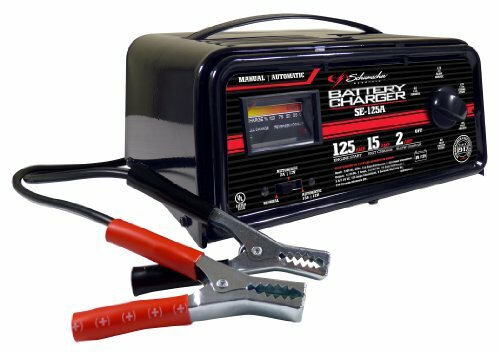 This high output, portable starter/charger has both manual operation and fully automatic. Ideal for professional mechanics and do-it-yourselfers. For use with 6 and 12-volt batteries. It has a 15-amp fast charge to help charge a battery in 2 to 4 hours and the 2-amp trickle charge can charge a small 12-volt battery in 2 to 12 hours. Also includes 125-amp engine start for emergency engine starting. 2 LED lights signal fully charged and reverse hookup. The 6 function rotary switch allows you to select the appropriate function. The fully automatic function will not overcharge batteries. 17 of 17 people found the following review helpful. I've owned this charger for 5 years. It has a "manual" function, meaning that you can charge a battery past the normal 80% that the automatic chargers will. It means you can also charge one more quickly because the automatic function (also on this unit) of most chargers tapers off the amperage sent to the charger as it reaches 80% of charge. (15 amps also goes faster than ten.) Manual means you can also "condition" a battery to get the sulfites off of the plates, by carefully charging and watching to the point where the battery plates begin to gas off. Means a battery will take and maintain a better charge and last longer. I use it on the RV cabin battery for this, but also use it regularly just for car stuff. All this and it does what other chargers do. 2 amp trickle charge, high powered capacitor starting function. I DROVE OVER THIS CHARGER WITH A 5000 POUND 1986 LTD CROWN VICTORIA TODAY! FLAT as a pancake. Ahem, well. First plugged it in and promptly blew the garage circuit breaker. Immediately started hunting for other Schumacher chargers on the net. After spending two hours and seeing this particular unit is now over $100 new, thought "Well, let's see if I somehow tear it apart and look." No sooner got the mangled housing off, and (uuuhhh!!) bent the back upright (which had a circuit board on it), plugged it in, and it works!! And, in the course of bending back the heavy steel housing, NO paint flaked off. Must be baked-on enamel. These babies are built tough. As another reviewer for Schumacher chargers said, "No repackaged imported junk". I take my hat off to this company: features, durability (! ), quality........ wow. 9 of 9 people found the following review helpful. This is, IMHO, a well made battery charger. Works well! (Even with the quirks noted below). 1) Has manual and auto modes and therefore will charge a completely dead battery. (Some , if not most, automatic only chargers need a couple volts to prove correct hookup and will not begin charging on a fully dead battery). 2) Heavy duty metal case. 3) Plenty of charging options including 6 volt for, perhaps, charging a single golf cart battery as found in RV and scooter apps as well. 4) Has "OFF" setting on rotary dial. Useful if using the 125 Amp start setting which has recommended max 5 sec duration per instructions. 1) Has poor rotary switch layout. Requires (most of the time) when switching to off or from 2A to 15A setting to cycle through the 125amp setting. This causes unnecessary stress on the battery and the cha rger. To avoid this one must unplug when changing setting. 2) Poorly written instructions regarding the use of the rotary switch vs the slide switch. Inst manual is generic for many of their chargers and not specific for this model. 3) Amp gauge on front of charger does not read in amps, but % of battery charge. Great for girls and girly guys, but not for the guys who have lawn tractors, boats, ATV's, etc. and really want to know what is going on at a glance. 4) Feet are molded from the metal case and do not have protective rubber pads to prevent marring and skiding. 1) Has green LED which lights when battery is fully charged in 15 amp automatic mode. Does not work in 2 amp mode where it might actually be useful. I had an older Schumacher that only had a 50 amp emergency boost, which was inadequate for most emergencies, so when that disappeared, I bought this SE-125A. I left it on the 2 amp charger setting for awhile on my Porsche's 12v battery while it was still connected in the car. It fully charged it and as stated in the owner's manual, when set on the 2 amp charge, the green light will not light when the battery is fully charged. The 15 amp, 12v automatic setting will turn on the green light when the battery is charged, but I wouldn't leave it like this for too long. I looked at the meter and the green light was lit, then the charger would stop charging with the meter falling off to the right. At the same time the green light would shut off, but then the meter would swing back to the left (charging again) and the green light would go on. This cycle took about 5 seconds to complete. After watching this happen many times over a period of 2 minutes, I unplugged it, feeling that can't be good for the Schumacher's longevity. It does the job and the price is right. The cord attached to the unit is relatively short, so you'll need a high quality 3-pronged extension cord if you want to use this charger while the battery is still connected in your vehicle.